Roc Koren (aka DR Roc) presented his Dr Roc and the Graduates show Friday night at the RMYC. 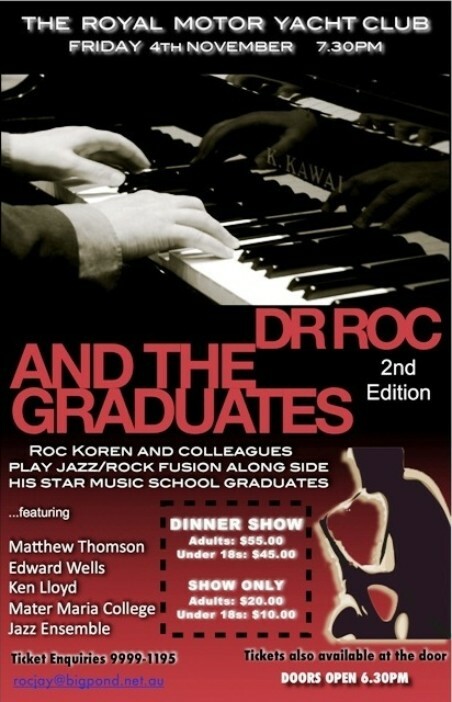 It’s the second time this event has been held, and it provided an opportunity for Dr Roc’s star music school graduates to play jazz/rock fusion alongside himself and his musical buddies. Abuzz with anticipation, the night was a great success. Dinner and show tickets sold out and many with show only tickets also attended. The atmosphere was a jazz supper club style and the music fit the bill perfectly. Graduates who stole the show were Mathew Thompson on piano and vocals, Edward Wells on piano and saxophones, both these young musicians played Jazz and Roc fusion with great musical flare and exceptional ability. Other highlights included Joe Giuffrida Guitarist and pianist singer song writer; he performed some great solo pieces, and was then joined on stage by Mathew and Edward as well as Ged Langford on bass and Brad Landy on drums. Know as the ‘Graduate’s Quintet’ they had the audience captivated with their singing and playing. A large part of the repertoire is songs and charts from the London Associated Board of Royal Schools of Music jazz curriculum. All of the musicians Passed the highest level 5th grade jazz piano exams from the London Board with Distinction. The repertoire also includes songs by Sting, Steely Dan, Stevie Wonder and jazz standards as well as original compositions. These are some of Sydney’s finest young musicians and it was a great opportunity to see them perform live. Roc has been a professional musician and teacher for 25 years. As well as a teacher, he is a jazz contemporary piano player, a soloist, bandleader, arranger, and conductor for jazz ensembles. The graduates are former pupils whom he helped prepare for jazz/piano examinations. Photos by Michael Mannington. on our Pictures page.